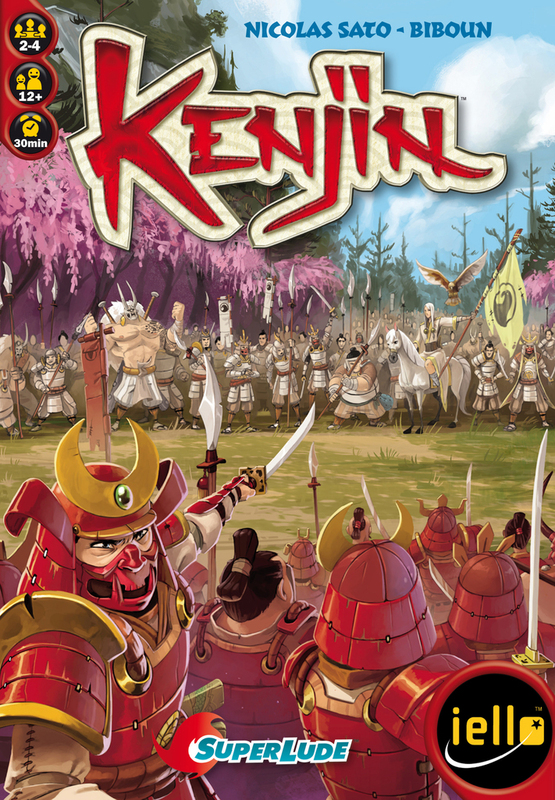 Kenjin is a game set in feudal Japan where players take on the role of competing warlords – trying to take control of the Japanese countryside though clever and strategic placement of their forces. 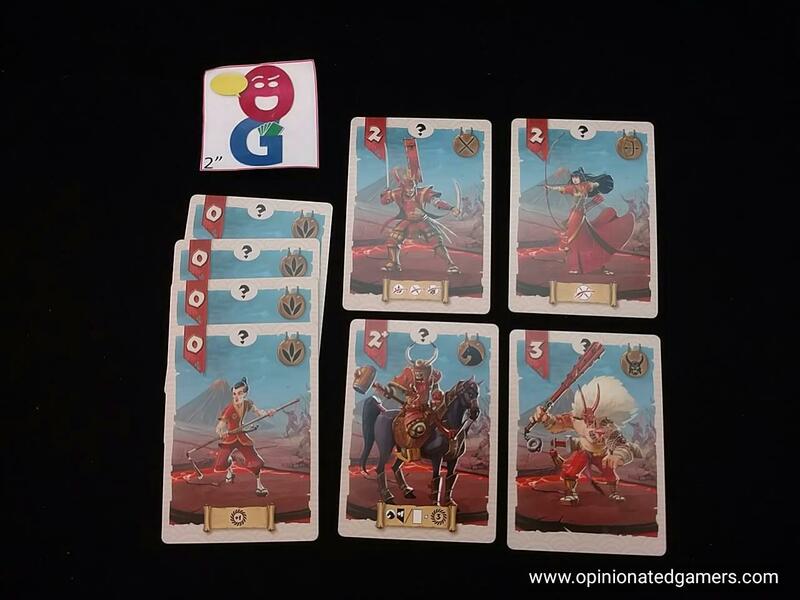 Each player chooses one of the four armies and takes an identical deck of 13 cards. There are big (6VP) and small (4VP) landscape tiles – one of each size is placed between players. Thus, in a four player game, there will be four pairs of tiles on the table in a cross shape, and each player will be competing over a pair with their left hand neighbor and their right hand neighbor. The game is played in two phases – Army Deployment first followed by Combat Resolution. In the deployment phase, you will play your hand of cards to the table. There are two different types – regular army cards, which are played face up, and secret unit cards, which are played facedown. Many of the cards have special abilities on them, and whenever the card is revealed, you must use the special ability on the card if possible. On your turn, you play two cards on your side of any of the four landscape tiles that you are fighting over. There is no limit to the number of cards that you can play to a tile, and you may split your two cards amongst two different tiles on your turn. If you play a regular card, it is played face up – and if that card has a special ability, it is executed as that card is played. If you play a secret card, it is played face down. No special abilities will be triggered at this time. If you have played multiple cards at a tile, you leave them in the order in which you played them – and stagger them so that players can see the total number of cards there as well as the summed value of the faceup cards. There will be seven rounds of placement, and in your last round, you will only have one card left to place. If this card is your Lord, you will have to take a 5VP penalty. When all the cards have been played, then the game moves into the Combat Resolution phase. In general, you can resolve them in any order, unless the Supply Camp tile is in play – if so, this must be done first. Most of the tiles have some sort of special rule printed on them which affects the cards played there or perhaps affects scoring. At the chosen landscape tile, first all the Secret Unit cards are revealed on each side, and their special abilities are resolved. There secret abilities have well defined priorities in the rules, so that there cannot be any conflicts. Thus, timing does not matter and all the Secret cards can be revealed and resolved simultaneously. Some of the secret abilities may cause opponent cards to be eliminated from this particular battle – and those cards are removed. Now, with the cards that are left, calculate your total strength. This is primarily found on the numbers printed on the card though landscape tile’s special ability often modifies the strength of one or more cards there. The player with the higher strength wins the tile – the loser removes all his cards from the tile while the winner leaves his there. If there is a tie for strength, the player with more cards at the tile wins. If there is a tie for number of cards, no one wins the tile. Each of the landscape tiles are resolved in this manner. Each tile is worth 4VP or 6VP as printed on the tile. In addition, each tile where you were victorious AND you have a Peasant card present is worth one additional VP. Additionally, if your Lord survived at a winning tile, you receive a 3VP bonus. The player who has the most VP is the winner. If there is a tie, the player who won the most tiles is the winner. There are also two variants included in the basic rules. The first one involves the selection of the tiles. In the base game, they are simply dealt out at random. Advanced players instead draft the landscape tiles and place them between the players themselves. The 4VP tiles are first selected starting with each player placing the chosen tile to his left. Then, the 6VP tiles are chosen – in reverse order from the first round – with each tile going to the right of the choosing player. There is also a team variant for four players. Teammates sit on opposite corners of the square, and thus, each player fights against each of the opposing team members. You can choose to lay out the tiles in either method. Play still alternates around the table, but scores of teammates are combined at the end of the game. 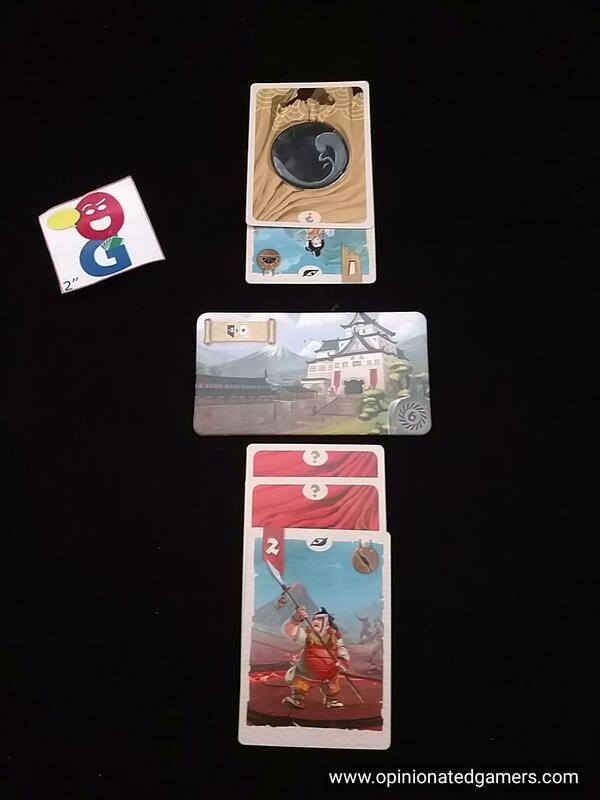 In Kenjin, you really only control the placement of 13 cards, but yet, there is a lot of depth to the game. 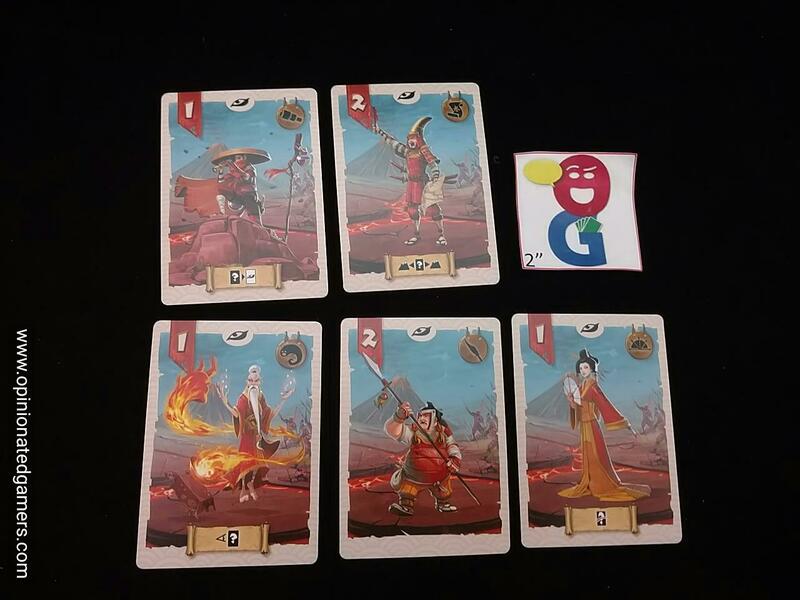 With many of the cards and landscape tiles having special abilities, and with many different multiple ways that the cards interact with each other – you have a lot of different ways to effectively deploy your forces to try to win the battles. The game is extremely tactical as you have to watch all four of your battles develop and then decide how and when you are going to place troops at each one. Further, you probably aren’t going to win all four of your battles, so trying to decide where to go a little light on your cards can be important. Five of the cards are regular which means that the other eight are secret, and thus facedown. Half of the facedown cards are just peasants – but the other half are the most powerful cards in the game. There is a lot of bluffing and subterfuge in play as you try to outwit your opponents. For me, the two most powerful cards, and the ones which I try to save until near the end of the round are the shujenga (which allows you to peek at any one facedown card of an opponent) and the General which allows you to move any one of your Secret cards to another battle. These two card really give you a chance to take control of a battle and win some crucial VPs. You will probably need to gain at least 14 to 16 points to win the game (there are 10VP in tiles for each player, and there are a number of different ways to score bonus points) – and you can use this target to try to figure out if you’re going to try to win three tiles, or go for two tiles and lots of bonus points from peasants and your Lord. (Sure, I suppose you could try to win all four tiles. But that just really isn’t a viable strategy IMHO…) Of course, your opponents are shooting for the same target number, so it’s not like it’s going to be an easy task. Oftentimes, the game comes down to one or two crucially placed cards or a tile special ability that suddenly changes the game. I have only played the partnership version once, but after my first game, I think that it will become the preferred method of play. The interaction between the partners adds a second level of strategy. You have someone else to discuss strategy with, and you can also also possibly affect the play of your opponents by choosing to overload a particular player. You are also allowed to use the special ability of the Supply Camp tile on your partner which can provide a decisive surprise advantage. The game might benefit from a player aid for the first few games. While many of the cards have explanatory icons at the bottom, not all cards refer to their ability. Until I was familiar with all of the cards (admittedly, only 9 varieties), I did have to refer to the rulebook frequently to remind myself of what the cards did. Likewise with the landscape tiles – some of them were easier to remember than others. Using the drafting variant should only be done if all the players are familiar with all of the tile special actions. Like many of the other games from IELLO in the past 12 months, there is a lot of game packaged in a relatively small box. 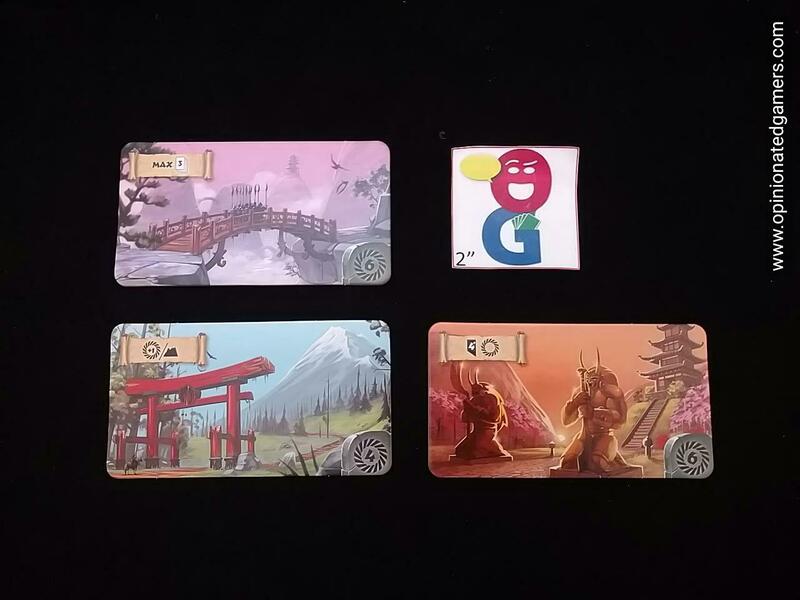 While I think that I will end up preferring the 4p partnership game, I also like the fact that this game scales perfectly in cutthroat games with 2, 3 or 4 players because you always have four tiles to fight for in each player arrangement with the same 13 cards in your hand. I thought this was a cool little alternative to Battle Line, especially for people who don’t want to do the work of proving a flag is yours and/or prefer a little bluffing in their games. Of course, the art is also much nicer!